Happy National Brownie Day!! I may not be the biggest fan of chocolate – which may have some wondering why I’m writing about brownies – but even I sometimes have a hard time resisting the moist, dense chocolatey goodness of a warm brownie with a glass of ice cold milk. 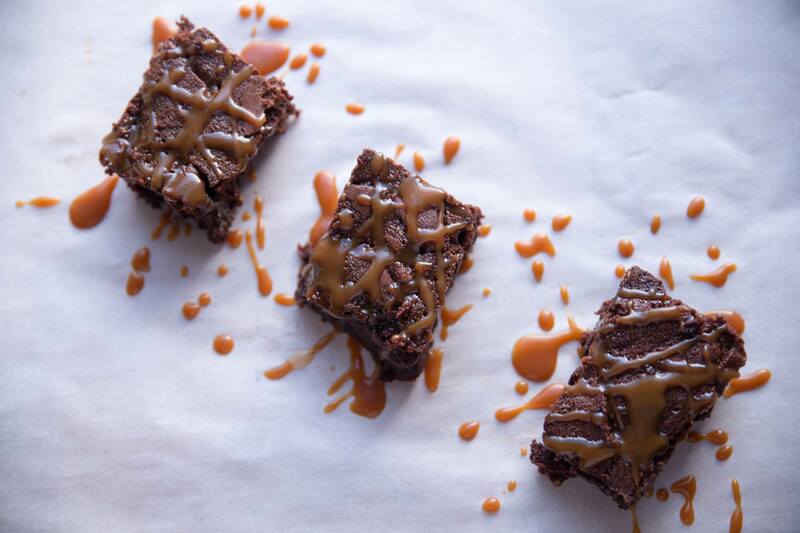 To celebrate this momentous occasion, I made a batch of Salted Caramel Brownies found in a cookbook called trEATs: Delicious Food Gifts to Make at Home written by April Carter. Being that April hails from England, all of the recipes are written in metrics (please correct me if I am mistaken), so I’ve included the conversions as well. 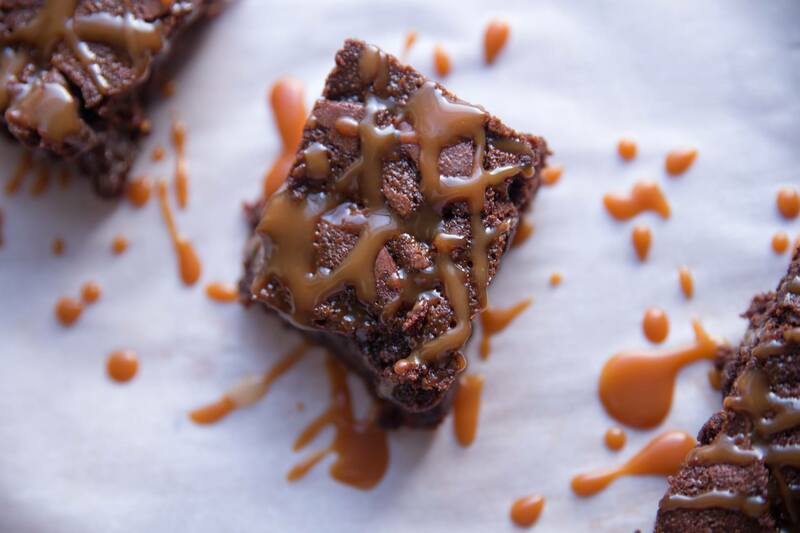 I think what helps to set this recipe apart is that nice drizzle of gooey salted caramel on top. It helps balance out the bitterness of the dark chocolate and helps contribute to the overall moistness of the brownie, itself. But be careful not to overcook your caramel because there is a fine line between sweet and bitter, and even I think I may have left it on for just a tad too long haha. Heat the sugar in a large saucepan over medium heat. 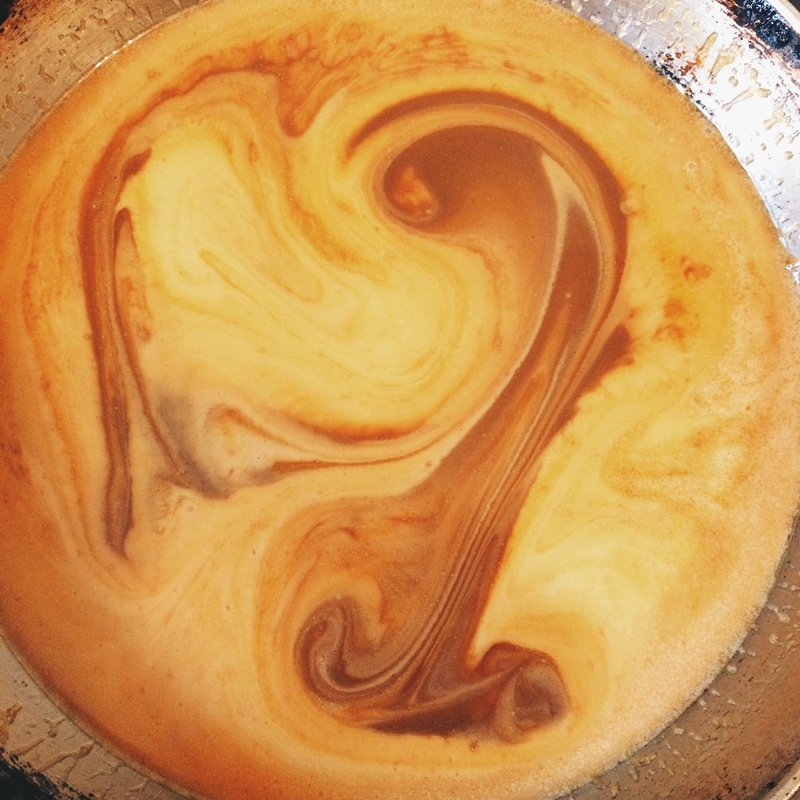 Once the sugar starts to melt, swirl and push the sugar into the liquid areas of the pan using a wooden spoon, but without stirring. 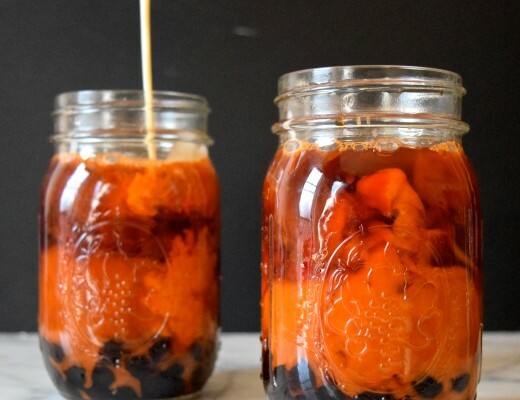 After about 10 minutes, or once the sugar has completely melted and dark amber in color, remove the saucepan from the heat. Whisk in the melted butter followed by the warmed cream. Stir in the salt. Pour the mixture through a sieve to remove any lumps of sugar and leave to cool before covering and chilling. Preheat the oven to 340°F. 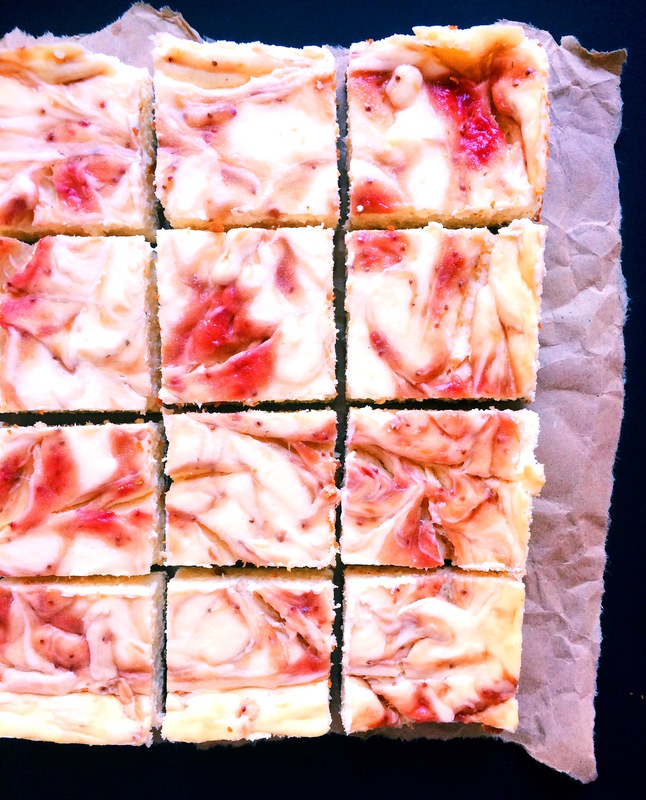 Butter a 8×8 inch square baking dish and line with parchment paper. Melt the butter and chocolate in a glass bowl over a saucepan of simmering water, ensuring that the water doesn’t touch the bottom of the bowl. Stir until the mixture is almost melted, then remove the pan from the heat. Continue to stir until the chocolate is completely melted and place to the side to allow it to cool slightly. Whisk the sugars, eggs and vanilla extract until light and foamy. Continue to whisk as you add the melted chocolate mixture. In a clean bowl sift the flour and salt, and gradually fold it in the chocolate mixture until the ingredients are just combined – do not over mix. 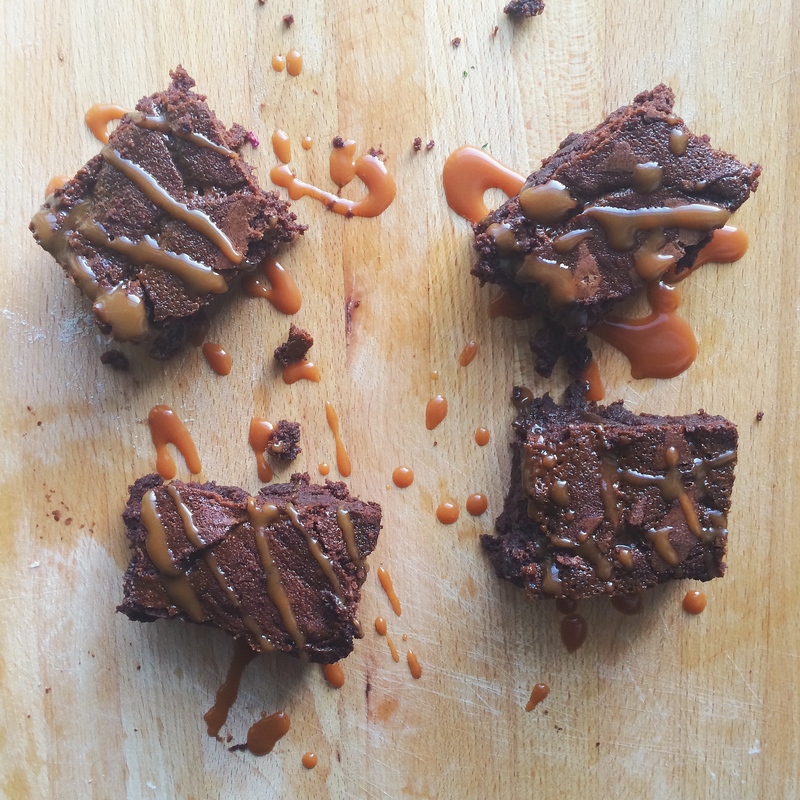 Pour the mixture into the prepared tin and drizzle the salted caramel over the top. Bake in the oven until inserted toothpick comes out clean – the sides and the top should be set and the center still moist. Well, I think I may be the biggest fan of chocolate and that just looks divine!